These basketball rebounding drills are from the Xavier Men’s Basketball Newsletter. The first drill is to work on rebounding out of a zone. 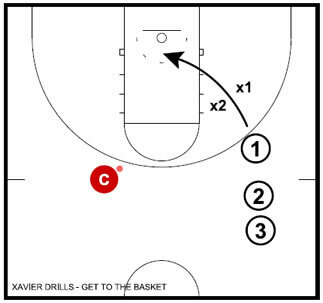 Drill #2 to work at being aggressive getting to the basket on offensive rebounds. Drill #3 works on defensive blockouts. Drill #4 is a full court competitive rebounding drill. In a zone, it is a little less defined as to who you are blocking out. This is one of the best drills to teach rebounding out of a zone. The players are numbered as shown. 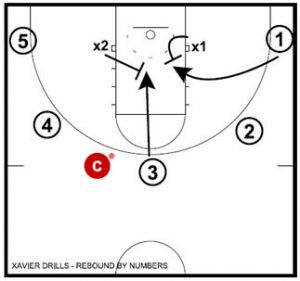 As he is shooting, the coach will call out two numbers (1.3) and those 2 players are the ones going in for the rebound. The defenders make contact, box, and push them out. If you don’t have enough players you could have one defender and three offense on the perimeter, only calling out one number. Place two defenders side by side facing the offense (if you have football pads use them). On the shot, the offense has to bust through to the basket. This teaches them to never surrender going to the basket and to be aggressive. Only drill this from the wings. If we have an offensive player at the top we would normally want him to get back on defense. Without the pads, the defense gives a little pressure, just enough to make the offense push through. On the shot (shot can be taken from different spots) the offense is going straight to the basket for the rebound. Defense is trying to block out until the ball hits the floor. The defense has to get three rebounds in order to be able to switch out. Defense is in the paint and matches up. On the shot by the coach, their goal is to go meet the offense outside the paint and keep them out of it. The offense is set up behind the three pont line and (except for the 1 who gets back on defense), are going hard to the rim. The defender on the 1 should look to help on boxing someone else out. 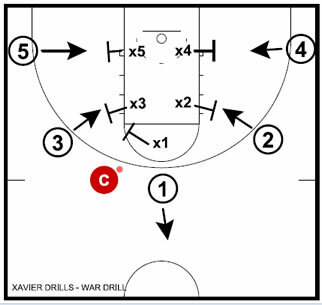 This is a highly competitive drill with a winner and a loser. If the offense gets the rebound they get a point and can try to score a 2 or 3 point shot. If they score we set the drill back up. If they score we set the drill back up. If the defense gets the rebound or forces a turnover, there is no point scored, but they push the ball down the court (transition offense) and try to score on the other end. 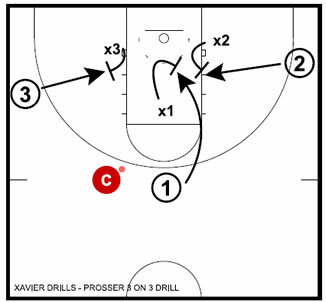 On a score or turnover by them, play stops and we set the drill back up.